My Breakfast Diaries | My Cooking Diaries "CooklikeCecilia.com"
I spend almost an hour and a half to two hours in the kitchen each morning before I leave for work (that’s because I am an early riser!). But you’ll don’t need to do that. With a little bit of planning, most of the recipes can be prepared ahead and completed in the morning within the least amount of time . Any cooking to be delicious requires to be made with a lot of patience and love…so we begin with the time-honoured ‘heart-shaped’ symbol of love! Butter the bread slices on both sides. Using a heart-shaped cookie cutter, cut-out the centre of the bread slices to form a hole. Get creative and use any cookie cutter shape. If you don’t have a cookie cutter just cut-out a round or square shape using a knife. Place the bread slices, two at a time in a frying pan (depending on the size of the pan) and lightly brown on both sides. 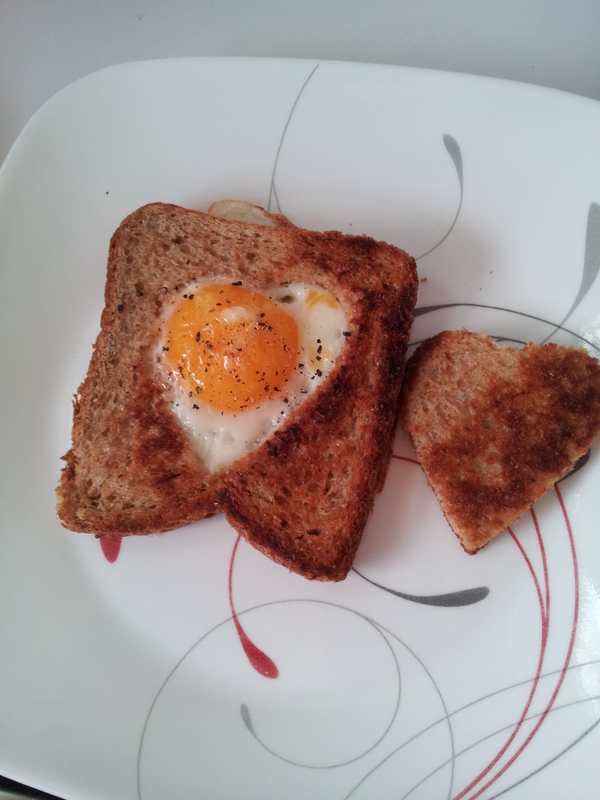 Crack one egg per slice into the bread hole and cook on slow flame until the white of the egg is completely set. Sprinkle with pepper and salt to taste. If you wish to have it well fried, turn the bread slice carefully and cook till the egg is well-done. Thank you Bibian… hope you enjoy it. Great job my friend Cis, I am proud of you, please don’t stop. Thank you Ivete, you are always very encouraging…appreciate it! Great Job A.Cecilia!! Looking fwd to trying out all your recipes.. pan poley, kheer n more yummy stuff.. Thank you Merlyn…great, will post soon.